Home/Cats, Dogs, Heartworm/Never Worry About Heartworms Again! 8 Super Simple Tips for Staying on Top of Your Pet’s Monthly Medications. Knowing how heartworms infect a pet helps us know how best to prevent them. 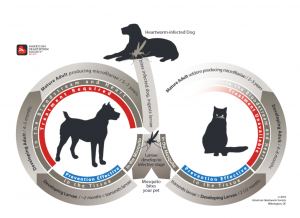 Let’s look at the typical cycle of heartworm infection. Third, your pet now has heartworm larvae and it takes up to 6 months before it can be detected in dogs. It is often not detectable in cats. Fourth, in dogs, heartworm infection can be deadly, and treatment is required. There is no treatment currently for cats. Signs in cats are not easy to detect and there is no approved drug therapy available for cats currently. Cat’s can often be helped through great veterinary care to keep their symptoms stabilized. Diligent monthly preventative medication and annual testing to be sure the medications are working is really the only way to prevent your pet from getting heartworms. Skipping doses or even being late on a dose can put your pet at risk. Heartworm infections can happen year-round. Be sure your pet eats the entire monthly dose of medication. This prevents lapses in coverage from month to month. We offer Interceptor Plus for dogs and Revolution for cats. We like Interceptor Plus for dogs because it not only protects against heartworm but also prevents 4 other intestinal parasites, adult hookworm, roundworm, whipworm, and tapeworms! As a mom, Dr. Cooper looks for protection on all levels- both for the pets in the household, but also their people! Revolution for Cats is a great 6-in-1 product because it protects against heartworms, fleas, ticks, ear mites, roundworms, and hookworms. That’s a lot of prevention in one monthly dose! If you have missed your pet’s monthly dose of heartworm prevention, we can help you get back on track! Give us a call at 949-766-4449 to schedule an appointment for a blood test. For the month of April, we are offering $20 off the heartworm test price for tests done in April. Plus, there is a really good rebate right now on Interceptor Plus. Buy a 12-month supply and get $15 back!